July 2010 – Busy month on DoYourDream! – Do your dream! July 2010 – Busy month on DoYourDream! Blimey! I know we like camping and adventures, but looks like we’re not the only ones! 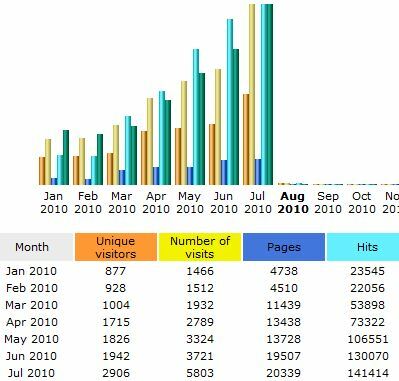 Almost 3,000 unique visitors in July – hopefully most found something interesting. Not bad either considering we’ve not had a major trip for 6 months! That said, as we write this, we’re filling the van up with water ready to go tomorrow on a 2 month trip, and this afternoon (after the F1 of course!) we’ll be looking at a map and deciding where we’re actually going to go. This site was set up just to be a diary/blog for friends and family and we did not expect this amount of traffiic. The downside of all the visitors is that my cheap hosting costs doubled in March when I had to upgrade the hosting to the next level, and already in July I hit my quota and will need to upgrade yet again to the next level! Mainly due to literally 1,000+ people downloading all our GPS Databases (POIs). The googleads go someway to cover our current costs but if we need to upgrade in August then we’ll either have to disable the downloads later in the month or upgrade again and hope the ad revenue goes up. So, if you like anything our ad sponsors have to offer, or indeed you buy from Amazon, then feel free to use our links on this site and help keep the site running. Hope you do find this site useful – and hope you have happy and adventurous travels!